Sorry, we are currently sold out of 'Enchanting Rainbow Fluorite Cube Beads - unusual'. Please check back later. 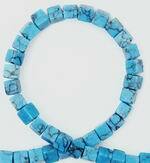 Sorry, we are currently sold out of 'Chinese Turquoise Cube Beads - Long 32" Strand'. Please check back later. Wonderful Millefiori Flower Diamond Tile Beads - a medley of color! Sorry, we are currently sold out of 'Passionate Pale Violet Pink Jade Cube Beads'. Please check back later. Sorry, we are currently sold out of 'Ravishing Carnelian Cube Beads - 6mm'. Please check back later. Sorry, we are currently sold out of 'Purple & Aqua Diamond Mosaic Calsilica Beads'. Please check back later. Sorry, we are currently sold out of 'Ravishing Royal Blue Lapis Cube Beads - 6.5mm'. Please check back later. Sorry, we are currently sold out of 'Sparkling Royal Blue Lapis Diamond Beads'. Please check back later. 122 Metalic Blue Hematite 3mm Cube Beads - Sparkling Bling! 21 Large Blue Turquoise Square Frame Beads - Unusual!